In the hometown and host of 2014 Asian Games is the next opponent of our national basketball team today, September 27, 2014. 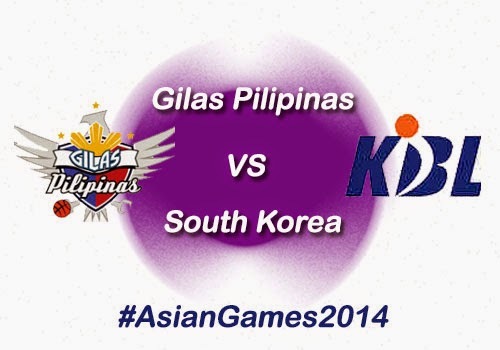 Gilas Pilipinas will face the one of its toughest basketball team in Asia, the South Koreans. This is the second game of our men's basketball team in quarterfinal round and it will go live at exactly 1:00 PM (Philippine Time). The live coverage of the game can be watch on TV5 Kapatid network or if you prepared to watch it online, you may try this link. We do hope that Gilas will win this match so that they may have a chance to go on semifinal stage. Before this game, for those who didn't know yet, Gilas Pilipinas suffered from back-to-back lost. First they're defeated by Iran in 5 points then yesterday, the Qatar team leads 9 points. According to news, South Korea won from its match against the unbeaten Kazakhstan team yesterday. Now! if you keep this page, you'll be updated by tweets of my fellow Twitter friends, just refresh this page more often. This is sad but we have to accept it. Gilas Pilipas defeated by South Korea in 2 points (95-97). Foul by Alapag. He fouls out in what could be his last game for Gilas. He scored 25 points. Fajardo gets fouled in the paint, splits his free throws. 78-71, #GilasPilipinas. "@rapplerdotcom: It's raining threes! 10 3-point conversion for Gilas Pilipinas 39-48 Gilas ahead 2Q #AsianGames2014"- WOOWWW! Comments or suggestions about "2014 Asian Games: Gilas Pilipinas vs South Korea Game Results, Highlights & Video Replay" is important to us, you may share it by using the comment box below.